If you're looking for a limousine bus experience that includes unlimited stops and unlimited pick-up locations, this is the package for you. This 6-hour private limousine bus will make stops at several well-known spots like Pat O'Brien's bar, Lafitte's blacksmith bar, and The Carousal bar. Water and soda chilled on ice, along with complementary beer, will all be provided on the bus. All guests must be at least 21 years old. 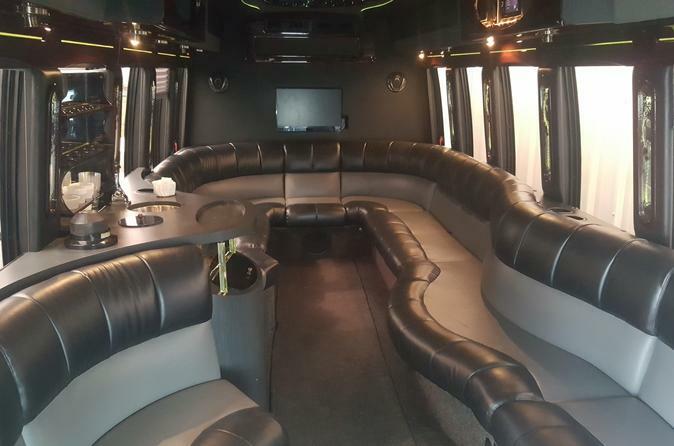 This chauffeured party bus features fiber-optic laser lighting, premium surround sound system and a wet bar with complimentary beer, soda, and bottled water. TVs and a DVD player are available for your entertainment from the time you step on, until the time you're dropped off. If you are venturing to the big city with your group, and you're looking for a safe and professional means of transportation, look no further. Along with a highly skilled and experienced team of friendly chauffeurs, enjoy 6-hours of worry free transportation.